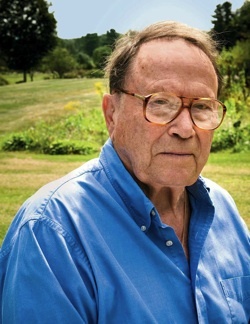 Hear Richard Wilbur read his poem "The Writer"
“The Writer”: Copyright © Richard Wilbur. Reprinted from Collected Poems, 1943-2004 (Harcourt). All rights reserved. Used with permission. From tangles overarched by this year’s canes. We shall have only blackness to behold. And a grandchild to talk with while we pick. “Blackberries For Amelia”: Copyright © Richard Wilbur. Reprinted from Collected Poems, 1943-2004 (Harcourt). All rights reserved. Used with permission. “A Measuring Worm”: Copyright © 2008 Richard Wilbur. Reprinted From The New Yorker (February 11, 2008). All rights reserved. Used with permission.